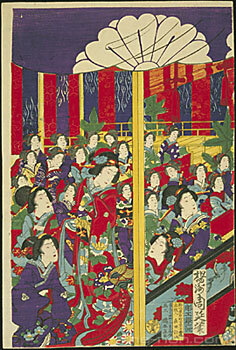 “A Scene at the Opening of Kōyōkan Theatre” by Yōshū Chikanobu, Colour Print (signed as “Drawn by Chikanobu”). and also known as the Shiba Noh Theatre. 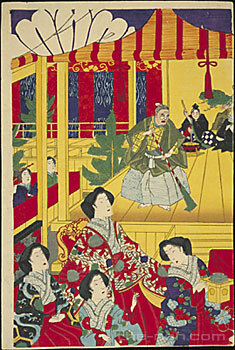 The scene is believed to be “Takasago” by Hōshō Kurō, performed on 16 April 1881 (Meiji 14). The Meiji Restoration brought difficult times to the Noh community, but on the other hand, one can also say that it ushered in a new phase in the art. One such positive effect was that it served a diplomatic role in giving foreign people opportunities to experience the exquisite essence of Japanese culture. After the fall of the shogunate, although Noh actors lost their salaries and were badly off, the art itself began to play an active role in diplomatic circles. Noh was considered an important entertainment for distinguished guests from overseas and was performed at receptions. The diplomatic role for Noh was pushed forward by Iwakura Tomomi, who held the posts of Foreign Minister and the Minister of the Right (the Junior Minister of State) in the Meiji Government. He organised the Iwakura Mission in 1871 (Meiji 4), and went on a tour of inspection of the United States and Europe that continued until 1873 (Meiji 6). During the tour, he found that opera, a unique Western music drama, was performed to entertain foreign VIPs. He thought that the same part should be played by Noh in Japan, and then strongly appealed for the restoration of Noh and its application to the diplomacy. However, the use of Noh as a diplomatic tool was not necessarily initiated by Iwakura’s sponsorship after his trip to the West. In 1869 (Meiji 2), two years before the Iwakura Mission’s departure, a program of Noh and Kyōgen was already performed to entertain foreign guests. In July 1869, the Meiji Government welcomed Prince Alfred, Duke of Edinburgh and the second son of Queen Victoria of the United Kingdom. They arranged for a Noh program to entertain the prince, as well as watching sumo wrestling and sightseeing in Asakusa. The program was held at a villa in Akasaka owned by the Kishū clan, and the following four pieces were performed: “Yumi-yawata” by Kita Katsukichi, “Tsunemasa” by Kanze Tetsunojō, “Hagoromo” by Hōshō Kurō, and “Kokaji” by Kongō Tadaichi. 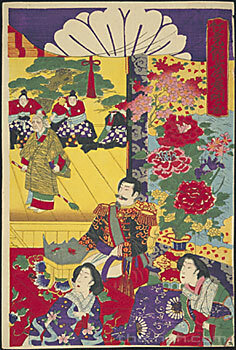 Two Kyōgen pieces, “Suminuri” and “Tachibai”, were also performed. In October 1872 (Meiji 5) when Prince Alexei of the Russian Empire visited Japan, a triple bill of “Kasuga-ryūjin” by Hōshō Kurō, “Shakkyō” by Kanze Tetsunojō, and “Funa-Benkei” by Nakamura Heizō was performed. According to a diplomatic document, a program of Noh and Kyōgen was held to entertain the Duke of Genoa, a nephew of the King of Italy, in September 1873 (Meiji 6). Three Noh pieces, “Orochi”, “Youchi-Soga” and “Funa-Benkei”, and two Kyōgen pieces, “Hana-zumo” and “Suō-otoshi” were performed. It is natural to think that the use of Noh at the early stage of Meiji diplomacy became a bridge for the Noh community to retrieve their power in later years. In 1879 (Meiji 12), a grandson of the German Emperor was received by the Maeda family (formerly the Lord of the Kaga clan) in June and a program of “Hashi-Benkei” by Umewaka Minoru, “Mochizuki” by Hōshō Kurō, and “Yoshino-Shizuka” by Mino Yoshimatsu, was presented, and in July a party with a program of Noh and Kyōgen was performed at Iwakura Tomomi’s residence to entertain General Grant from the United States. In March 1881 (Meiji 14), two Noh pieces, “Momijigari” and “Shōjō”, and several dance pieces were performed by Umewaka Minoru and his followers before King Kalākaua of Hawai’i. According to press reports, the king especially admired one of the dance pieces that featured exaggerated posturing, and greeted the performer with applause saying it was truly a dance of samurais. In November, two grandsons of Queen Victoria, Prince Albert and Prince George (the future King George V), were welcomed with a Kyōgen program of “Suminuri” and “Koshi-inori” in Kyoto. It was also the year when the Noh community got into its stride with the establishment of an all-school organization, Nōgakusha, and the Shiba Noh Theatre. According to records, a program of Noh and Kyōgen was performed to entertain the missions from the Joseon Dynasty, Park Young-Hyo and others, before they returned to Korea in December 1882 (Meiji 15). A Noh program was arranged to welcome Prince Nikolay of the Russian Empire (future Emperor Nicholas II, the last Russian emperor) in May 1891 (Meiji 24). However the plan was cancelled because the prince was injured in an assassination attempt in Ōtsu in Shiga Prefecture. There were several gatherings to pray for his recovery in various parts of Japan. In Hikone, a city close to Ōtsu, a Noh program was performed as a prayer in a shrine. Those episodes indicate the Japanese people’s feelings. In July 1899 (Meiji 32), Prince Heinrich of the German Empire was entertained by a Noh program including “Hashi-Benkei” and “Shakkyō”, and in September 1902 (Meiji 35), Lord Zaizhen of the Qing Imperial Family was welcomed by a program of Noh and Kyōgen. So far, we have mainly browsed through several events presented for foreign royalty, but in addition to these, many Noh programs performed in the Meiji era to entertain other foreign guests, including diplomats, soldiers, scholars and artists. The time was shortly after the reopening of interchange between Japan and foreign countries, after a long period of national isolation. Perhaps contemporary Japanese statesmen had both high hopes and anxiety concerning diplomatic activities. These records indicate that Noh played a minor but brilliant role, conveying Japanese culture in a living form, in a significant interchange at the cultural and spiritual level on occasions when diplomatic relations were strained. One cannot help wondering exactly what there was in Noh that foreign VIPs considered unique to Japan.